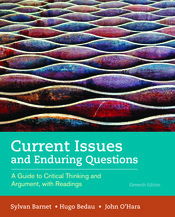 The unique collaborative effort of a professor of English, a professor of philosophy, and now, for the first time, with John O’Hara, a professor of critical thinking, Current Issues and Enduring Questions is an extensive resource for teaching argument, persuasive writing, and rigorous critical thinking. This extraordinarily versatile text and reader continues to address current student interests and trends in argument, research, and writing. Readings on contemporary controversies and classical philosophical questions are sure to spark student interest and lively discussion and writing. Comprehensive coverage of classic and contemporary approaches to argument includes Aristotelian, Toulmin, and a range of alternative views, including an expanded chapter on analyzing and writing about visual arguments. This edition has been updated with exciting new topics, more critical thinking help, and 2016 MLA guidelines.